Coastal art is selling like hotcakes. Seashells, beach chairs, and palm trees create a sense of relaxation in our busy lives. Who wouldn’t want to bring a little rest, relaxation, and ‘fun in the sun’ into their lives? 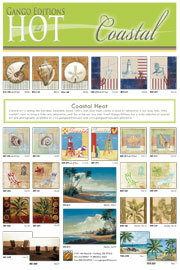 Visit www.gangoeditions.com to see the full selection of coastal images or download our new Coastal Hot List today. Keep coming back to the Design Lab for more hot themes!